Earlier today President Obama officially endorsed Democrat presumptive nominee Hillary Clinton for President. In an endorsement video released by the Clinton campaign, Obama made it clear he wants Clinton to win the White House in order to preserve his legacy. White House Press Secretary Josh Earnest also made this point clear during the daily briefing. "She’s got the courage, the compassion, and the heart to get the job done." 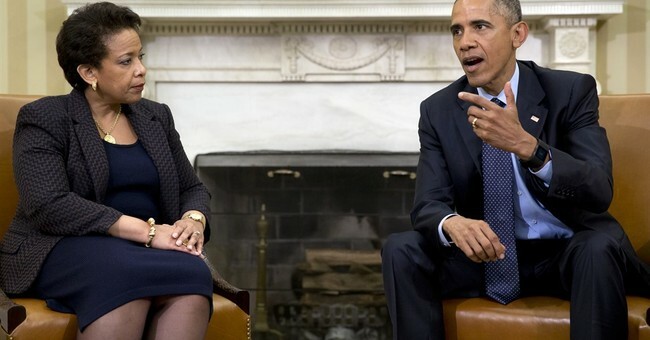 Shortly after the endorsement was made, President Obama met with Attorney General Loretta Lynch this afternoon in the Oval Office. The meeting was closed to the press. Lynch, of course, will ultimately make the decision as to whether Clinton will be prosecuted should the FBI issue an indictment surrounding her use of a private email server to store and transfer top secret, classified information. In order for Clinton to carry Obama's torch, she has to stay out of prison. In order to do that, she has to avoid prosecution. I'm sure Obama made that very clear to his somewhat new Attorney General.